Novelist and playwright Broder (Taking Care of Cleo, 2006, etc.) presents a series of vignettes about his family. Broder begins by delving into his parents’ life stories, tracing the contours and examining particular moments (“All histories are selective,” Broder says in the foreword). The book is organized by decades and shares meaningful moments, beginning in the early 20th century before Broder’s birth (which sets the stage) and carrying through to the ’80s. While the book lacks a traditional narrative structure and arc, its straightforward, sweet retelling will remind readers of a grandfather sharing his delightfully quaint history, a peek into a sepia-toned old world. Readers learn of Broder’s father’s self-discipline and ethics and his mother’s lack of confidence. Intriguingly, the author doesn’t simply superficially serve a scramble of stories. Instead, he utilizes these portraits to demonstrate the effects of his parents’ behavior on his personality and growth. 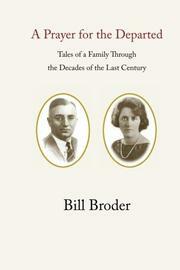 For instance, upon Broder’s discovery of an old paper of his father’s that succinctly detailed his father’s goals and aspirations, the father comes to represent “moral standards.” Broder’s careful, eloquent meditations upon family life transform this account from a mere history or memoir to a celebration of, and tribute to, family life. “What a curious idea,” Broder says when examining the idea that his family had “shared a life.” This curiosity propels the book and lends an authenticity and engaging quality to the author’s musings. Though his subject matter may seem extremely limited and personal, his elegiac, sincere storytelling keeps readers hooked and appreciative of a time that once was. The book’s glance at history as a moving force and its examination of each decade allow readers to realize and experience history and the past. Broder not only shares his life and journey with readers, but allows them to touch and feel it. A tender, inquisitive book that will appeal to those from old and new worlds.